If you’ve read my books or heard me speak about my life in France, you’ve heard about my French mother-in-law (belle-mère in French, a prettier term than the English one by far). 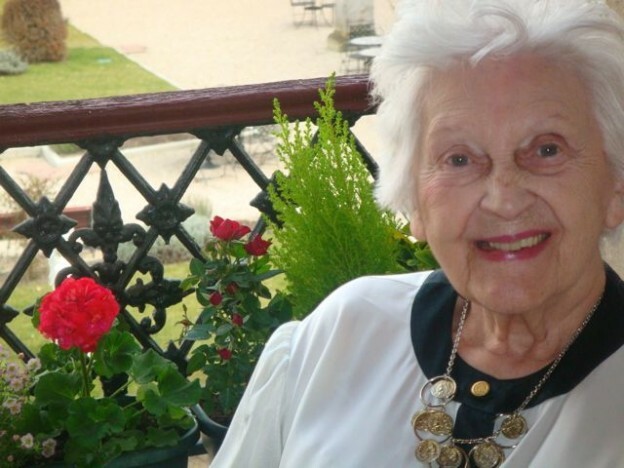 She passed away last Sunday at the age of 98 so this is the moment to pay tribute to an exceptional and much-loved lady who peopled my life and my books. When I married her son Philippe forty years ago, I was filled with the usual qualms all daughters-in-law everywhere have about their mothers-in-law. Would we get along? Would we agree? Disagree? Have fun together or not have any fun at all? In addition to those general questions, I had some particular ones, considering that I was American and my mother-in-law French. Would our cultural differences bring us together or divide us? To take a practical example, would it be a problem if I didn’t set the table the French way? Burst out in loud American laughter? And another practical question: what was I to call her? Should I use the informal tu or the formal vous? The latter questions were quickly solved. I called her by her first name, Marie-Jeanne, and I addressed her with the formal “vous” as she did with me. Tu is more familiar and creates less of a distance, but I have always remained convinced that the formal vous was the perfect form for us. And it certainly didn’t keep her from affectionately calling me ma petite Harriet or ma petite fille. And she did. She didn’t even register shock as the 15 friends filed in. She greeted each by name, with a smile and a bise, then proceeded to the kitchen to prepare a simple delicious meal that would fill many hungry stomachs. On these last minute occasions, she’d often make the Rochefort potato omelette I wrote about in French Fried. She’d produce a fresh head of lettuce, make a homemade vinaigrette, find something in the house that would serve as a starter (her starters were always so lavish that in the beginning I thought they were the meal), ask husband Henri to run to the fromager so she could put a dazzling variety on the cheese plate. Even with no warning, her meal was so skillfully done and artfully presented that it looked as if it had taken days instead of minutes. She always wanted people to feel at home, and they did, staying late into the night, laughing and talking. As for my French, if it’s as good as it is, it’s due in part to Marie-Jeanne who corrected my mistakes rarely and gently. Not only grammar mistakes but usage. One day I told her that I had bien bouffé at her table. She laughed and told me that bouffé is for animals, not people. Humans say diné. I could cite countless other examples of little tips like this that got me out of trouble and helped me speak decent French. I also got a primer in Perigourdin expressions which my mother-in-law used frequently. Born and raised in that beautiful region in southwest France, she spoke that melodious dialect fluently although she didn’t want people to know it when she came to Paris and became a Parisienne. She referred to the small balls of soft white bread I would separate from the crust as tapous. (I understood that doing that was not très élégant and stopped, retaining only the word as a souvenir of this bad habit). My huge bowl of coffee was a bachou (basin). I would often insert these words into a French phrase and even French people didn’t know what I was talking about! Marie-Jeanne may have looked like the grandmother we all imagine, with her white hair, sparkling blue eyes, and soft skin (I once asked her what cream she used and she told me she had never used anything other than soap or water) but she was a strong woman who kept her household running smoothly. She planned meals and cooked and served and cleaned up, mended all our clothes, took care of the grandchildren, tended her plants, and especially, made sure the ambiance was good. She once told me that keeping things on an even keel and extinguishing potential conflicts was important. She did that well and graciously and with a smile. Frankly, I owe most of what I know about France and the French to Marie-Jeanne and her son who, I often told her, she raised right (and well before Women’s Lib). This is a man who never leaves a trail of dirty clothes on the floor, who can cook and sew and iron, and who, like his mother, thinks of others before himself. Pas mal, as the French say. Mothers-in-law more often than not get a bad rap. Sometimes it’s deserved, sometimes not. Was mine an exception? I don’t know. All I know is that for me she was truly une belle personne and a belle belle-mère. Now that she’s gone, I’m happy I often told her so. This entry was posted in Uncategorized on June 15, 2013 by harriet.welty.